Hannibal, an award-winning writer and emerging emissary from scientists to the public, sets out to become a citizen scientist herself. In search of vanishing species, she wades into tide pools, follows hawks, and scours mountains. The data she collects will help environmental research—but her most precious discovery might be her fellow citizen scientists: a heroic cast of volunteers devoting long hours to helping scientists measure—and even slow—today’s unprecedented mass extinction. A consummate reporter, Hannibal digs into the origins of the tech-savvy citizen science movement—tracing it back through centuries of amateur observation by writers and naturalists. Prompted by her novelist father’s sudden death, she also examines her own past and discovers a family legacy of looking closely at the world. Her personal loss only fuels her quest to bear witness to life, and so she ultimately returns her gaze to the wealth of species still left to fight for. 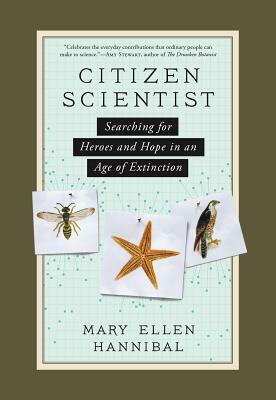 Combining research and memoir in impassioned prose, Citizen Scientist is a literary event, a blueprint for action, and the story of how one woman rescues herself from an odyssey of loss—with a new kind of science. Mary Ellen Hannibal’s work has appeared in The New York Times, San Francisco Chronicle, Esquire, and Elle, among many other outlets.